At Sangha Studio, ​we aim to make yoga accessible—we were all new once, too! We’re here to welcome you as you are, and support you to tailor your practice so that it’s just right for you. Many people believe they must already be flexible to start a yoga practice. Not true! All you need is the desire and openness to learn. We have a wide variety of slow moving, moderately paced, and more physically demanding classes available weekly at both studio locations. You’ve got to start somewhere; here are our favorite entry points! For complete beginners to yoga, we recommend our monthly Yoga for Beginners workshop. You can learn more and see upcoming dates for that class on our Workshops & Events page. We also recommend any weekly drop-in classes marked in their description as “beginners encouraged”, including: Mellow Morning, Slow Massage Flow, Spa Yoga, and Strong & Slow. These classes move at a slower pace and allow a little more time and freedom to figure things out. If you’re looking for something more active and don’t mind moving quickly, Flow might be a good fit. Regardless of the style of class you're looking for, you'll find all of our class descriptions here. Can’t make it to the monthly workshop or those specific class styles? Don’t be shy to come try another class that suits your availability and interest. Know that you can always take your practice at your own pace, find variations of poses that work for you, and take breaks when you want. 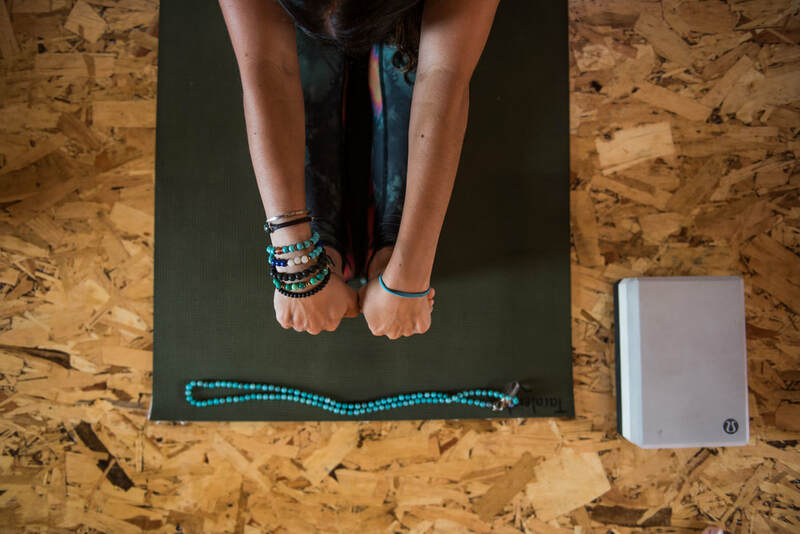 If you’re a complete beginner, we recommend avoiding Flow II or Core Flow as your first class, because they will move at a faster pace and require some knowledge of general yoga poses and principles. Most of our classes are 60 minutes, though we have a handful of 75 and 90-minute classes, as well as 30-minute “Pause” classes. Most 60-minute classes follow a general format of 3-5 minutes of centering, meditation, or breathing exercises at the start of practice, followed by movement (varies depending on the type of class), and ending in a 3-8 minute “savasana” or “final rest” where students find a comfortable position to rest. 75-minute and 90-minute classes may offer longer opportunities for centering/meditation/breathing practice at the beginning and savasana/resting at the end. 30-minute classes will often have shortened centering practices and a shortened savasana/rest. We have two studio locations in Burlington, VT! Learn more about each studio their class schedules by following the buttons below. 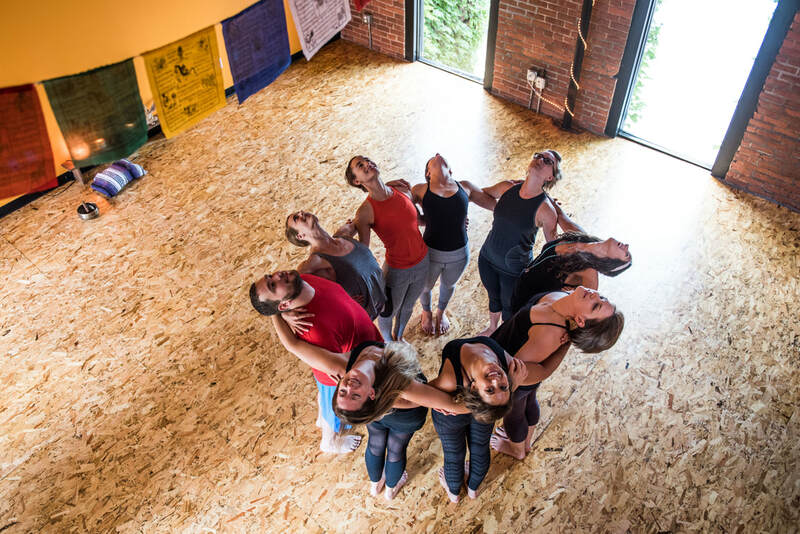 Sangha Studio – Pine | 120 Pine St.
Sangha Studio – North | 237 North Winooski Ave.
See answers to some of our most frequently asked questions! ​Do I need to pre-register for class? You can use MindBody (our online booking platform) to pre-register for classes on our weekly schedule, but you don’t need to. We’ll always make space for folks to join class. If you do sign up online, there are fewer options for donation amounts. Should you choose to donate something not listed and would prefer to pre-register, simply call us (802.448.4262) and we will sign you up for class, then you can donate whatever you want when you arrive! If you’re planning to join us for a workshop or special event, we do recommend signing up online (or calling us at 802.448.4262) because those classes often have a capacity. ​For both classes and workshops, we may lock the doors 10-15min after it starts. ​You should wear clothes that you can move in. You don’t need anything fancy, just think loose or fitted stretchy clothing you'd wear to play a sport or lounge at home! Note that we practice barefoot or in socks, so we ask that all shoes stay in the lounge. Sangha Studio – Pine | 120 Pine St.: There is a public parking garage just 1.5 blocks away. Metered parking is available out front on Pine St. and along neighboring Main St. & College St. The studio is set back behind a parking lot, but please note that this parking lot is reserved for neighboring business owners from 7am-5pm Mon-Fri, and outside of those permit-only hours it is a privately-owned paid lot with rates of $4/hour. 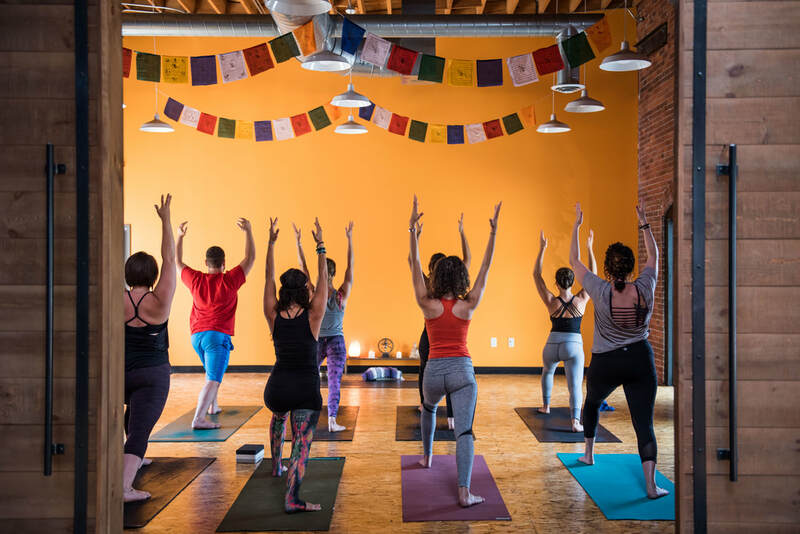 Sangha Studio – North | 237 North Winooski Ave.: All parking in the Old North End of Burlington is free on-street parking. You can often find parking right outside the studio on North Winooski Ave, or along side streets. The parking garage behind our building is reserved for the tenants of the apartments above our studio. "On my very first class I felt how much love Sangha has within its community of yogis. Every time I walk through the door I feel so welcomed and the studio has shown me compassion, dedication and helped me love and nourish my mind and body from the inside out. I'm so thankful to be apart Sangha!" Sangha Studio is a place to practice, to give, to receive, to love, to reflect, to do good, to do well, and to simply be. The most welcoming, forgiving, inspiring group of people in all the land. Can't recommend it enough for any yogi or yogini who is seeking community, refuge, grounding, and growth. ​Every class that I have been to at Sangha has been great! The space is welcoming and the instructors are very accommodating. The monthly membership is well worth it! Love both the North and Pine st. Locations! Warm, welcoming atmosphere, lovely teachers, and the community classes are a wonderful thing to offer that not many places do. Plus the donation based fees make classes affordable for anyone! The atmosphere at Sangha Studio is incredible. Each teacher has something unique to teach, while all sharing the ability to make every participant feel engaged, welcomed, and motivated. I went with a friend to my first yoga class (ever) at Sangha Studio and knew immediately this was a community I wanted to be a part of.